Children are growing up by this program since 1986. 40 children are accommodated in Shishu Sadan. The organization will continue to guide them with proper care until they become self-reliant and acquire the ability to maintain their livelihood. I stepped in IAA in 1986 when I was only 4 years old. There I was growing up in a very warm and friendly environment. I finished my graduation and now I am working. I am happily married and I still hold those glorious moments and keep a strong and untouchable memory in my life of IAA. I am truly grateful to Kawamura aunty who made all these possibility. "It is not important where you are from however it is very important where you go" Boro Vhai (Md. Azizul Bari) always said this to us. His words worked as a manufacturer of our dreams. He always enlightened us with his thoughts and ideas. 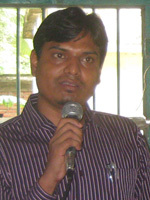 I graduated M.A in law from Rajshahi University and now I am working as an assistant District Judge. I would like to thank to all the Japanese people for developing our humanity. I started my journey in IAA as a little girl who was scared of expressing her views and thoughts. As days passed I learned how to dream, I learned how to be a better person from this organization. Now I am 1st year student of MA. 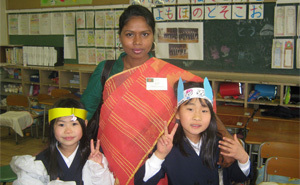 I have been to Japan on a language scholarship program. Since then I dream of doing something bigger for the people in life. Finally my window of thought has widely opened. Of course all these credits came from none other than IAA. Human resource development is very important for our populated country. Education is the backbone of nation. Keeping this in mind, the Organization provides scholarship to poor & meritorious students from Class VI to University level. Now a number of 4,500 students are receiving the opportunity to continue their study. Then we are supporting the fund to those who are suffering to pay SSC & HSC Examination fee. I was only a student of High School when my parents started having difficulties to support me for my further education. Since 1992 International Angel Association has been supporting me continuously till 2006 when I finally completed my M.Sc from Chittagong University. Now I am working as the first executive officer in Jamuna Bank. If IAA would not have provided me with its generous support, I doubt I could have made it like this. It is not just me. There are about a thousand of other students who have been provided with the similar support and who are now successfully playing their roles in the society. I am thanking IAA from the bottom of my heart on behalf of all the other that IAA has been supporting. I have lost my father in a very young age. We are ten brothers and sisters at that time. It was really difficult for me to continue with my education. I was almost giving up when the light of International Angel Association reached my steps. I was benefited by a stipend every month. This helps me to complete my M.B.B.S course from Shere Bangla Medical College. 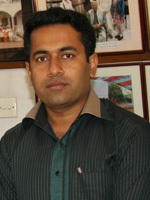 I am working successfully as a doctor in a hospital since 2009. I am truly grateful to IAA for their kind support. I would like to repay this kindness that IAA offered me by providing health care to people. My father was a marginal farmer, however I always dream of doing something great in life unlike him. I was more into studies rather than helping my father with agriculture. When my father was unable to provide me with all the expenses required for education, I was going to give up my hope. But soon I was provided with its humble support from IAA. I completed my M.Ag from Bangladesh Agriculture University. 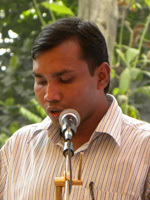 Then I joined as a lecturer in Patuakhali Science and Technology University in 2009. IAA provides the educational support to over 4500 students every month. A huge number of students got their dreams fulfilled through IAA like me. I cannot express my gratitude towards IAA in words. I am truly grateful. I left Neherland on a scholarship program for further education in 2011. I'll be back to my country after my PHD. Then I help as many as I can. Literacy rate is still low in our country. The purpose of this program is to train women for creating the future mother who can teach the children the importance of education. 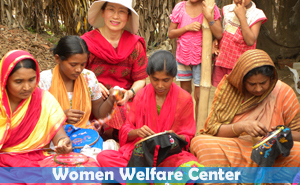 Now the rural women were trained for basic education and social awareness through 6 centers at Kapasia in Gazipur. The children of today will lead the nation tomorrow. But if their education is not complete, they might not be able to lead the country to peace and prosperity. With keeping this mind, the organization started Yuriko Angel School from January 2005. This school has the subject which is not applied for rural area such as Physical Education, Drawing and Music to extend the students ability. It has also the honesty shop which sells the stationery goods such as the notebook, ball-pen, and pencil and so on. In this shop there is no office staff to sell and just students see the price of goods and put the money in the box. We provide the training to women on tailoring, Nakshi Kantha embroidery, Type Writing & Computer Course since 1993. The organization gives free hostel accommodation and food for all trainees who request to stay. Many trainees successfully completed the course so far. Training enhances skill and increases prospects for competent jobs. Type Writing Course as closed in 1999 because the computer study was spread out day by day in the country and no one was interested in studying Type Writing. Computer Course was closed in 2007 because the computer institutions were set up in this area and any one can study. After my father died, I have my mother and 7 brothers & sisters. So I have to do something for my life. So I had to admit this training center. After completing this course I went back to my village and teach 10 women what I learned. So I got teaching fee every month and use this money for my young brothers' and sisters' education expenses. If I could not admit this institute, my life might be corrupted. Also I learned about the manner and rules for group activities. These are so useful for my life. Thank you very much for Japanese volunteers who support this program. Women Welfare Center creates the job opportunities in tailoring and handicraft ex-trainees through its production center. A number of 13 women are regular working in Konabari center. About 300 women are working in other 2 sub centers at Kapasia Upazila under Gazipur district. Then finally these productions are send to Japan and are sold by Japanese Volunteers as the fair trade. We provide the training in Agriculture, Poultry, Dairy and Fisheries to the rural women since 1994. Trainee must graduate from Secondary School and have some land for cultivation. We have 2 sessions (Jan-June & July- Dec) and each session has 30 trainees who are selected all over the country. The organization gives free hostel accommodation and food for all trainees. Trainees who completed the course are working at GOs, NGOs, private farm as well as in their own agriculture fields. Also the short training on poultry provided to 2000 rural people at Gazipur district. We closed this course in 2011 because the demand of Agriculture Training for women is not required nowadays. Now we are continuing it as an Agriculture Farming Program. After completing my SSC, I was uncertain about what to do as I did not have the chance to carry out my education. Then I came to know about IAA's Agriculture Training Program and I got into the 25th batch in2008 with 30 other rural women. After completing the course, I came back to my village and stared a poultry farm with 500 broiler chicks, 5 cows, and 5 goats. During my training I have learned how to vaccinate cattle. So now along with the poultry farm I also vaccinate all the animals around the village. Now I am a self-reliant woman and a thousand of other rural women like me got the chance to become self-sufficient. I would like to thank IAA for creating this excellent opportunity for rural women. 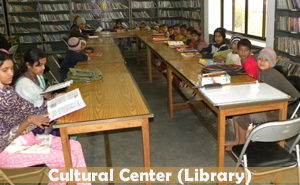 A large number of students and local people get opportunities to read books by this center. A number of 8000 books are available in this library. Every year the Cultural Center arrange cultural program and speech contest on the day of the International Mother Language day, the independence day, the Hiroshima day, the victory day, the birth Anniversary of Rabindranath, Nazrul, Jashim Uddin, Abbas Uddin and Joynal Abedin. 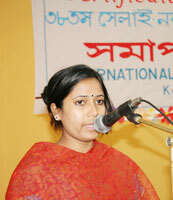 The students of different school & college participates this speech contest and cultural program. 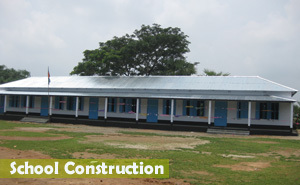 There are 5 Community Library for the rural people at Kapasia in Gazipur District. 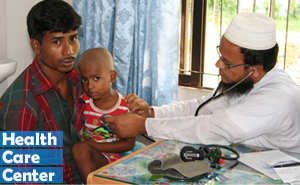 We are serving the medical facilities to the local people with minimum fees at our Health Care Center. Regular Doctors such as gynecologist, child specialist and eye specialist consult for general patients. Pathological test, X-ray, Ultrasound and other facilities are given to the people with reasonable rate. Outside Health Care Program is going on every Friday at Kapasia for those who have no chance to go to Hospital due to financial problems and clinic is so far. Yearly Eye Camp is arranged in the end of December with being cooperated by Japanese Eye specialists (POSA). 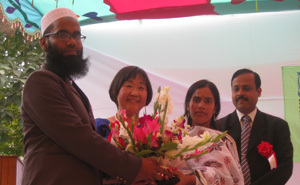 Japanese Volunteers donate the tube-well and toilet set up fund for the hygienic purpose of the rural people and the school students in Bangladesh. The organization set up tube-wells and toilets in the different schools, Mosques and villages to ensure safe drinking and adequate sanitation. Sreejoni is a nonformal primary education for those children who are not going to school for their family problem. 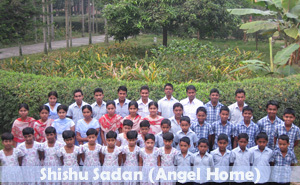 A number of 60 local children in konabari village are provided this support by International Angel Association. Every morning they have class from 9am to 11.30am. 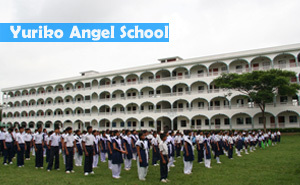 Books, Uniform and all other education material are supplied to them. Children are also provided with food after class.The Children enjoy the class very much.